We've been seeing bits and pieces of what to expect from Windows Phone 8 when it is finally released in a few months. We knew about Internet Explorer 10, and other features, but we're just hearing about a much wanted new feature that could be included: dictation. concerns of every mobile user. Apple has turned to Nuance and its Dragon software to power not only Siri, but its text dictation; and, Google built its own voice recognition services with the help of ex-Nuance talent. 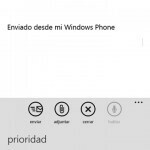 Microsoft has voice search in Windows Phone, and has planned expanded voice commands in WP8, but until now we hadn't seen anything about dictation. Those playing around with the Windows Phone 8 emulator saw that there is a new option labeled "talk" in the e-mail app. It's disabled in the emulator, but is expected to be fully working when it hits phones. The only question here is how extensive the dictation options will be. 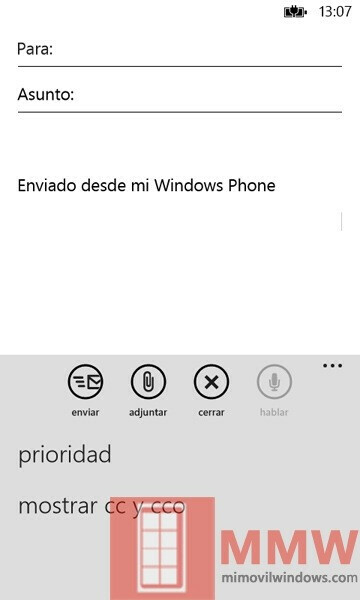 Other screenshots haven't shown the option in any other text fields, and we haven't seen the QWERTY keyboard for WP8, just the rumored radical slanted keyboard, and even that didn't have a dictation button that we could see. It's possible that this dictation will only be available in the E-mail app, or maybe just E-mail and Messaging. As yet, we don't know. oh so they will add siri-like to the platform too? sweet... first siri then google now then blackberry 10's assistant (if ever thats true) and now windows phone?! i am really hoping to have this 4 platform fighting... i really hate seeing only apple's iphone and google's android phones are making market... i wanna see Windows phone and blackberry phones too!!!! All of the platforms had some voice dictation/commands prior to Siri. Siri was significantly better than the rest when it came out, but WP7's TellMe already did web & local searches, calling and texting contacts, opening applications, and voice-to-text and text-to-voice dictation for instant messaging. Improving on these services is the only logical direction; they wouldn't try to make it worse. Lol. A) iOS and the iPhone haven't been out for 6 years. B) Microsoft was pretty dominant with Windows Mobile prior to iOS and Android. That should eliminate your couldn't. C) iOS HAD its rule. It has now been overtaken by Android, and is unlikely to ever gain it back. D) Your comment has to be one of the most factually errant comments I've ever seen on this site.